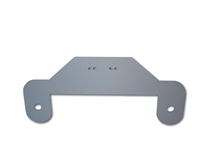 Universal License Plate Camera Mount. Fits Heavy Duty and Medium style cameras (camera not included). Comes unpainted. Bolt holes are 7" apart (standard US license plate dimensions). Universal Winch Fairlead Camera Mount. Bolt holes are 10" apart (standard winch fairlead dimensions).